This was the paper I delivered at The Theorizing the Web Conference, New York, 18th April 2015. I urge you to track down the other, superb, papers on my panel by Natalie Kane, Solon Barocas, and Nick Seaver. You can view a video of (some of) the panel here. I posted this up just after Facebook published a study into how their algorithms effect the stories users see (and vice versa). Wired used the surprise UK election result to talk about the study. Commentators took issue to media misunderstanding and misrepresentation of the study. The furore is well worth considering before/after you read my paper (which is now in dire need of an update). Data churning algorithms are integral to our social and economic networks. Rather than replace humans these programs are built to work with us, allowing the distinct strengths of human and computational intelligences to coalesce. As we are submerged into the era of ‘big data’, these systems have become more and more common, concentrating every terrabyte of raw data into meaningful arrangements more easily digestible by high-level human reasoning. A company calling themselves ‘Narrative Science’, based in Chicago, have established a profitable business model based on this relationship. Their slogan, ‘Tell the Stories Hidden in Your Data’,  is aimed at companies drowning in spreadsheets of cold information: a promise that Narrative Science can ‘humanise’ their databases with very little human input. Kristian Hammond, Chief Technology Officer of the company, claims that within 15 years over 90% of all news stories will also be written by algorithms. But rather than replacing the jobs that human journalists now undertake, Hammond claims the vast majority of their ‘robonews’ output will report on data currently not covered by traditional news outlets. One family-friendly example of this is the coverage of little-league baseball games. Very few news organisations have the resources, or desire, to hire a swathe of human journalists to write-up every little-league game. Instead, Narrative Science offer leagues, parents and their children a miniature summary of each game gleaned from match statistics uploaded by diligent little league attendees, and then written up by Narrative Science in a variety of journalistic styles. According to Mayer- Schönberger and Cukier this makes Prismatic able ‘to tell the world what it ought to pay attention to better than the editors of the New York Times’. A situation, Steven Poole reminds us, we can little argue with so long as we agree that popularity underlies everything that is culturally valuable. Data is now the lifeblood of technocapitalism. A vast endless influx of information flowing in from the growing universe of networked and internet connected devices. As many of the papers at Theorizing the Web attest, our environment is more and more founded by systems whose job it is to mediate our relationship with this data. Here, I want to pause to set in play at least three elements from Lyotard’s text that colour this paper. Firstly, the historical confluence between technocapitalism and the era now considered ‘postmodern’. Secondly, the association of ‘the grand-narrative’ with modern, and pre-modern conditions of knowledge. And thirdly, the idea that the relationship between the human and the machine – or computer, or software – is generally one-sided: i.e. we may shy away from the idea of leaving the responsibility of our children’s education to a machine, but Lyotard’s position presumes that since the machine was created and programmed by humans, it will therefore necessarily be understandable and thus controllable, by humans. Today, Lyotard’s vision of an informatically literate populous has more or less come true. Of course we do not completely understand the intimate workings of all our devices or the software that runs them, but the majority of the world population has some form of regular relationship with systems simulated on silicon. And as Lyotard himself made clear, the uptake of technocapitalism, and therefore the devices and systems it propagates, is piece-meal and difficult to predict or trace. At the same time Google’s fleet of self-driving motor vehicles are let-loose on Californian state highways, in parts of sub-Saharan Africa models of mobile-phones designed 10 or more years ago are allowing farming communities to aggregate their produce into quantities with greater potential to make profit on a world market. Algorithmic narratives appear to continue this trend. They are piece-meal, tending to feedback user’s dreams, wants and desires, through carefully aggregated, designed, packaged Narratives for individual ‘use’. A world not of increasing connectivity and understanding between entities, but a network worlded to each individual’s data-shadow. This situation is reminiscent of the problem pointed out by Eli Pariser of the ‘filter bubble’, or the ‘you loop’, a prevalent outcome of social media platforms tweaked and personalised by algorithms to echo at the user exactly the kind of thing they want to hear. As algorithms develop in complexity the stories they tell us about the vast sea of data will tend to become more and more enamoring, more and more palatable. Like some vast synthetic evolutionary experiment, those algorithms that devise narratives users dislike, will tend to be killed off in the feedback loop, in favour of other algorithms whose turn of phrase, or ability to stoke our egos, is more pronounced. For instance, Narrative Science’s early algorithms for creating little league narratives tended to focus on the victors of each game. What Narrative Science found is that parents were more interested in hearing about their own children, the tiny ups and downs that made the game significant to them. So the algorithms were tweaked in response. Whilst we can program software to translate the informational nuances of a baseball game, or internet social trends, into human palatable narratives, larger social, economic and environmental events also tend to get pushed through an algorithmic meatgrinder to make them more palatable. The ‘tomorrow’ that Hammond claims his company can help us prepare for is one that, presumably, companies like Narrative Science and Prismatic will play an ever larger part in realising. In order to unpack Wendy Chun’s proposition here we need only look at two of the most powerful, and impactful algorithms from the last ten years of the web. Firstly, Amazon’s recommendation system, which I assume you have all interacted with at some point. And secondly, Facebook’s news feed algorithm, that ranks and sorts posts on your personalised stream. Both these algorithms rely on a community of user interactions to establish a hierarchy of products, or posts, based on popularity. 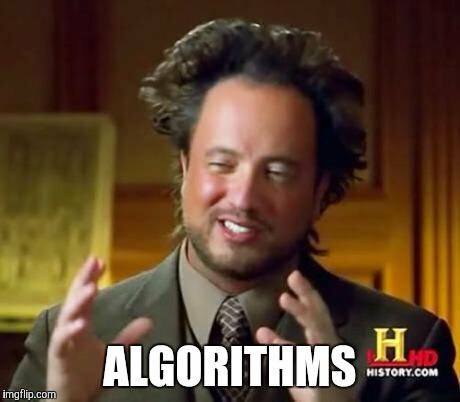 Both these algorithms also function in response to user’s past activity, and both, of course, have been tweaked and altered over time by the design and programming teams of the respective companies. As we are all no doubt aware, one of the most significant driving principles behind these extraordinarily successful pieces of code is capitalism itself. The drive for profit, and the relationship that has on distinguishing between a successful or failing company, service or product. Wendy Chun’s reminder that those that carry out an action, that program and click, are not the agents here should give use solace. We are positioned as sovereign subjects over our data, because that idea is beneficial to the propagation of the ‘product’. Whether we are told how well our child has done at baseball, or what particular kinds of news stories we might like, personally, to read right now, it is to the benefit of technocapitalism that those narratives are positive, palatable and uncompromising. However the aggregation and dissemination of big data effects our lives over the coming years, the likelihood is that at the surface – on our screens, and ubiquitous handheld devices – everything will seem rosey, comfortable, and suited to the ‘needs’ and ‘use’ of each sovereign subject. I would argue that the ‘grand narratives of legitimation’ Lyotard claimed we left behind in the move to Postmodernity will need to return in some way if we are to manage big data in a meaningful way. Crises such as catastrophic climate change will never be made palatable in the feedback between users, programmers and technocapitalism. Instead, we need to revisit Lyotard’s distinction between the true and the useful. Rather than ask how we can make big data useful for us, we need to ask what grand story we want that data to tell us. Steven Levy, “Can an Algorithm Write a Better News Story Than a Human Reporter?,” WIRED, April 24, 2012, https://www.wired.com/2012/04/can-an-algorithm-write-a-better-news-story-than-a-human-reporter/. “Steven Poole – On Algorithms,” Aeon Magazine, accessed May 8, 2015, https://aeon.co/magazine/technology/steven-poole-can-algorithms-ever-take-over-from-humans/. Jean-François Lyotard, The Postmodern Condition: A Report on Knowledge, Repr, Theory and History of Literature 10 (Manchester: Univ. Pr, 1992), 50. Brian Massumi, Parables for the Virtual: Movement, Affect, Sensation (Duke University Press, 2002), 128. Edmund Berger, “The Anthropocene and the End of Postmodernism,” Synthetic Zero, n.d., https://syntheticzero.net/2015/04/01/the-anthropocene-and-the-end-of-postmodernism/. Wendy Chun, “Crisis and the Temporality of Networks,” in The Nonhuman Turn, ed. Richard Grusin (Minneapolis: University of Minnesota Press, 2015), 154. Rajendra K. Pachauri et al., “Climate Change 2014: Synthesis Report. Contribution of Working Groups I, II and III to the Fifth Assessment Report of the Intergovernmental Panel on Climate Change,” 2014, https://epic.awi.de/37530/.